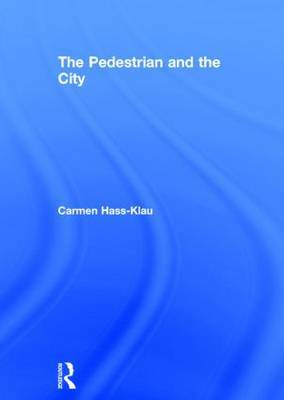 The Pedestrian and the City provides an overview and insight into the development, politics and policies on walking and pedestrians: it includes the evolution of pedestrian-friendly housing estates in the 19th century up to the present day. Key issues addressed include the struggle of pedestrianization in town centers, the attempts to create independent pedestrian footpaths and the popularity of traffic calming as a powerful policy for reducing pedestrian accidents. Hass-Klau also covers the wider aspects of urban and transport planning, especially public transport, essential for promoting a pedestrian-friendly environment. The book includes pedestrian-friendly policies and guidelines from a number of European countries and includes case studies from the UK, Germany, Britain, France, Spain, Italy, the Netherlands, Denmark, the US and Canada, with further examples from ten additional countries. It also contains a unique collection of original photographs; including `before' and `after' photos of newly introduced pedestrian-friendly transport policies. As the pedestrian environment has become ever more crucial for the future of our cities, the book will be invaluable to students and practicing planners, geographers, transport engineers and local government officers.